Fishing and Adventure by Day. Comfort by Night. We can accommodate up to 10 guests per week. The main guest house is comprised of two double-occupancy rooms and two single-occupancy rooms, each with a private bath. The “honeymoon” cabins sleep two each with private baths. All our guest cabins are riverfront offering a breathtaking view of the river and you never know what you might see walking the banks. Red fox, moose, bald eagles and even brown bears are commonly sighted. 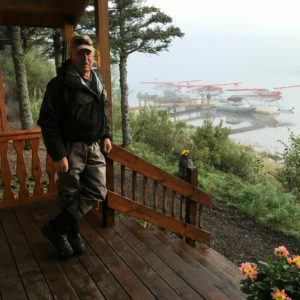 The cabins have river view decks with sitting areas for wildlife viewing, enjoying stunning sunrises over coffee or gorgeous sunsets over cocktails. The riverside line of cabins are connected by a boardwalk which will take you right to the hot tub and sauna. Both honeymoon cabins are cozy one room buildings containing a queen and twin beds, sitting area, beverage refrigerator and a private bathroom. Riverside windows ensure that you have a beautiful view from within the whole cabin. Each of the two honeymoon cabins sleep two guests. The main guest cabin is our largest cabin, sleeping eight guests. It has four bedrooms and bathrooms, a large living room, stocked bar, fireplace and wader room. Each of the four bedrooms has two twin beds and private bathroom. 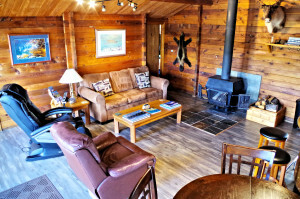 Most guests will gather at the end of the day in the guest cabin’s living room area to sit by the fire, have a drink, enjoy an appetizer, start a card game and maybe even tell a fish story or two. You can find the kitchen, dining room, lodge office, TV viewing area, and Pro Shop in the main lodge building. 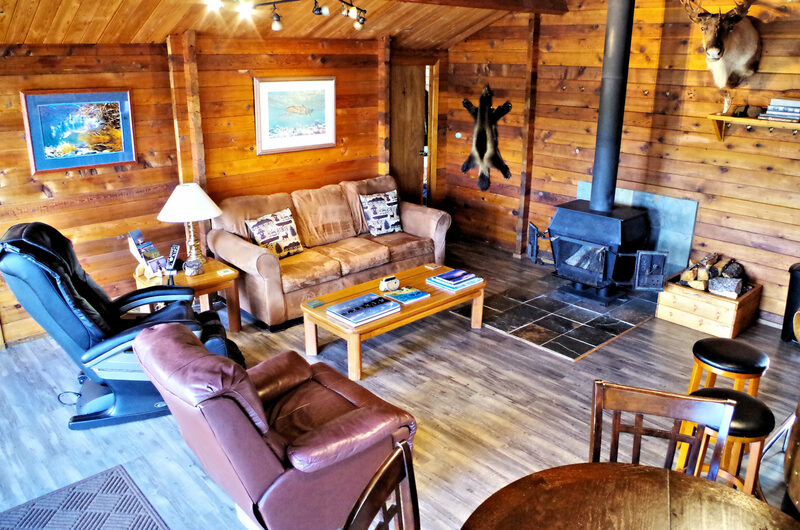 The lodge has been added onto many times, but at the center of it is the original cabin that homesteader Ingdal Bertinussen lived in when Jack Holman bought it in 1973 (read the full story here). That history is literally at the center of No See Um Lodge to this day.